A tremendous work of art. 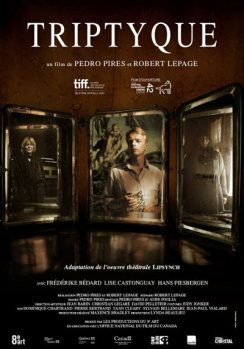 The Rendez-Vous French Film Festival’s closing night film, Triptyque, is described as a “contemporary urban saga.” It’s the story of Michelle (Lise Castonguay), a schizophrenic bookseller, her sister Marie (Frédérike Bédard), and Thomas (Hans Piesbergen), her German neurosurgeon. Marie and Thomas end up falling in love, and Michelle has just been released from a mental institution and returned to work in a bookstore. A triptych is a work of art (usually a panel painting) that is divided into three sections or hinged panels. The middle panel is typically the largest and it is flanked by two smaller related works, although there are triptychs of equal-sized panels. Just like a triptych, the film is split into three sections each focusing on one of the main characters as they go through a major event in their lives. Marie would form the laerge middle panel with Michelle and Thomas on either side of her. With quite a dark tone, the film is about overcoming mental and physical pain through personal discovery and relationships. Marie and Thomas seem to understand each other in a way that transcends all barriers and Michelle’s poetry and unique way of looking at the world is inspiring. Through poetry and emotionally poetic scenes, these three characters figure out how to express themselves. As the cinematic adaptation of the play Lipsynch (also directed by Robert Lepage), Triptyque retains the themes of speech, communication, and the human voice as indicators of identity and emotion. All three actors also performed in the play and their deep connection with the text is apparent. I think this is a film that needs multiple viewings to truly appreciate all it has to offer. Each scene is so full of meaning and each character so layered that once just isn’t enough. I enjoyed this profound, unconventional story and I think it is a tremendous work of art.